Courage Campaign | Stop Big Pharma's price gouging! Last fall, big drug companies spent $100 million to defeat a ballot measure that would have controlled the prices of prescription drugs. Now, they're at it again -- furiously lobbying to stall a bill that would bring transparency in drug pricing to California. They're no dummies -- information is power. If drug companies are forced to admit they're gouging Californians, they might have to stop doing it. That's why we’ve joined a powerful coalition of organizations including the California Labor Federation, NextGen America, DailyKos, and others in organizing to stand up to Big PhRMA. With enough people power, we can get this critical legislation out of the Assembly and onto the governor's desk. We'll deliver your signatures directly to the offices of key lawmakers on September 6, so we need you to add your voice now! 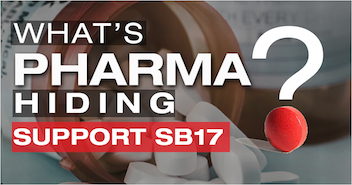 Will you sign the petition to pass SB 17 and make Big PhRMA tell us the truth about drug pricing? “I call on you to pass SB 17 by Sen. Ed Hernandez. Prescription drug costs have increased 20% since 2013, and in the case of some common, life-saving drugs -- like EpiPens and insulin -- prices have spiked without warning and for no good reason. Consumers and policymakers need the transparency offered by this bill as an important first step in holding pharmaceutical companies accountable for price hikes and controlling costs of drug prices."